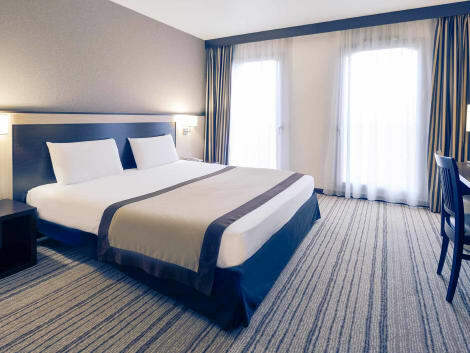 The ibis Rouen Champ de Mars hotel is located on the eastern outskirts of Rouen, a 10-minute walk from the city center, 547 yards from the Charles Nicolle University Hospital and just 1.2 miles from the train station. The hotel has 78 air-conditioned room s with free WIFI. A bar, a 24-hour snack service, and a fitness area with gym, sauna and hammam are available. Paying indoor car park. The ibis Rouen Champs de Mars hotel is the ideal location for business trips or for visiting Rouen. See you soon! 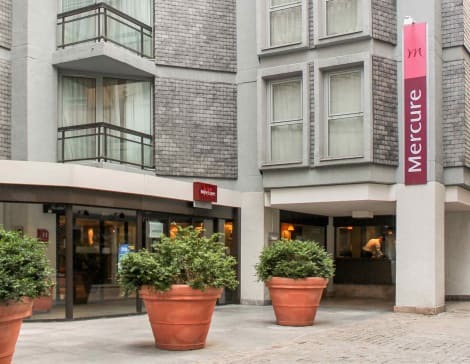 Located a 10-minute walk from the historic city center and the Cathedral, the Mercure Rouen Champ de Mars hotel offers modern rooms with all the comforts you need for a business trip or a stay with family. Want to relax? Visit our sauna and hammam. Enjoy regional specialties in our restaurant and discover our selection of wines and cocktails at the bar. This Mercure hotel is an ideal location for organizing a seminar or a getaway. Take advantage of the hotel's room service (during limited hours). Wrap up your day with a drink at the bar/lounge. Buffet breakfasts are available daily from 6:00 AM to 9:30 AM for a fee. Make yourself at home in one of the 78 individually decorated guestrooms, featuring minibars and Smart televisions. Wired and wireless Internet access is complimentary, and flat-screen televisions with cable programming provide entertainment. Private bathrooms with bathtubs or showers feature complimentary toiletries and hair dryers. Conveniences include phones, as well as safes and desks. 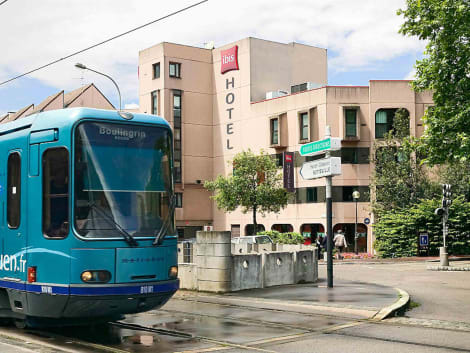 The Hotel ibis Rouen Centre Rive Gauche St Sever offers 80 air-conditioned rooms with free WIFI and is located right by St Sever metro station, 0.6 miles (1 km) from the center of Rouen and close to the SNCF Rouen Centre train station. It is ideal for business travel or vacations as its location provides easy access to Rouen's main tourist attractions: the Armada, Kindarena sports complex, Île Lacroix ice rink, St Sever shopping mall, the exhibition center, the Zénith arena and the impressionist museums. A stay at Hôtel Beauséjour places you in the heart of Rouen, within a 15-minute walk of Rouen Cathedral and Tour Jeanne d'Arc. This hotel is 0.5 mi (0.9 km) from Square Verdrel and 0.6 mi (1 km) from Musee des Beaux-Arts. 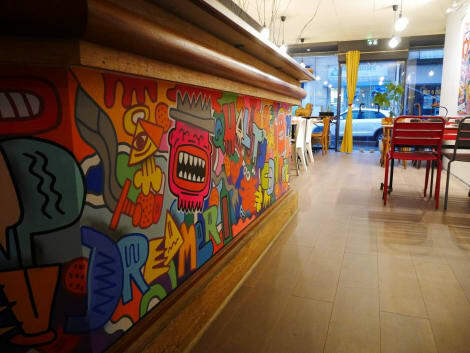 With a stay at Street Art Hotel, you'll be centrally located in Rouen, within a 5-minute walk of Rouen Cathedral and Rue du Gros-Horloge. This hotel is 0.2 mi (0.4 km) from Rouen Opera House and 0.2 mi (0.4 km) from Rue Saint-Romain. Stay in one of 19 guestrooms featuring flat-screen televisions. Complimentary wireless Internet access is available to keep you connected. Bathrooms have showers and complimentary toiletries. Conveniences include desks, housekeeping is provided daily, and irons/ironing boards can be requested. This unique hotel is located in the Centre of Rouen and offers modern rooms with thematic decoration dedicated to a famous Impressionist painter. It is 500 metres from the Rouen-Rive Droite railway station and a 10-minute walk from the city's famous cathedral. The Church of St. Ouen is a short walk away and the Rouen Museum of Fine Arts is a 5-minute walk from the hotel. The hotel's cosy guest rooms are simply furnished for an unpretentious atmosphere, and guests can wake up to a delightful breakfast in the breakfast room each morning. With a stay at ibis Rouen Centre Rive Droite, you'll be centrally located in Rouen, steps from University of Rouen and within a 5-minute walk of Panorama XXL. This hotel is 0.7 mi (1.1 km) from Jeanne d'Arc Church and 0.7 mi (1.1 km) from Place du Vieux-Marche. Defined by beautiful architecture and world-class historic and cultural sights, the glamourous city of Rouen is a gorgeous place to spend a few relaxing days in beautiful surroundings. If you're looking for stunning sights, top bars and restaurants, Rouen in Upper Normandy really is the place for you. The city is tucked alongside the Seine, and it's a city characterised by French glamour and must-see historic hotspots including the famous gothic Notre Dame Cathedral, immortalised on canvas by Claude Monet. Rouen has been a prestigious city since the Middle Ages, so there are lots of amazing places to take in, including Rouen Castle, where Joan of Arc was threatened with torture and imprisoned. 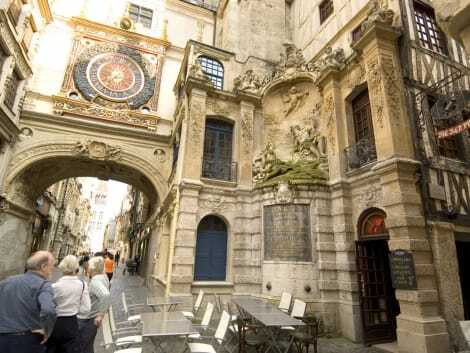 History lovers should definitely take time to wander down the medieval Rue du Gros-Horloge too. It really is a rare example of brilliantly preserved period architecture and it's an atmospheric place to spend a bit of quality time in. If you'd prefer to soak up some culture, head over to one of Rouen's many museums and galleries like the well-known Musée des Beaux-Arts de Rouen celebrating artists like Claude Monet, and the historical museum, the Musée des Antiquités. Or, for a more relaxing day altogether, visit the beautiful Botanical Gardens and unwind in tranquil surroundings. There are a whole host of fine dining restaurants in Rouen, so you can splash out in style. Gorgeous French food is served at the classy Gill restaurant and Restaurant Origine. And for more budget-friendly options, check out TrendBurger or go to the lovely gastropub, Le Sens des Vins for a meal and a glass of wine. For the perfect Rouen hotel, have a look at somewhere close to the heart of the city so you can experience all it has to offer. Luxury places include Hotel de Bourgtheroulde and Suite Novotel Rouen Normandie, while more affordable accommodation can be found at the likes of Hotel Ermitage Bouquet and the Ibis Rouen Champ De Mars.